Permablitz #19-POSTPONED until further notice. 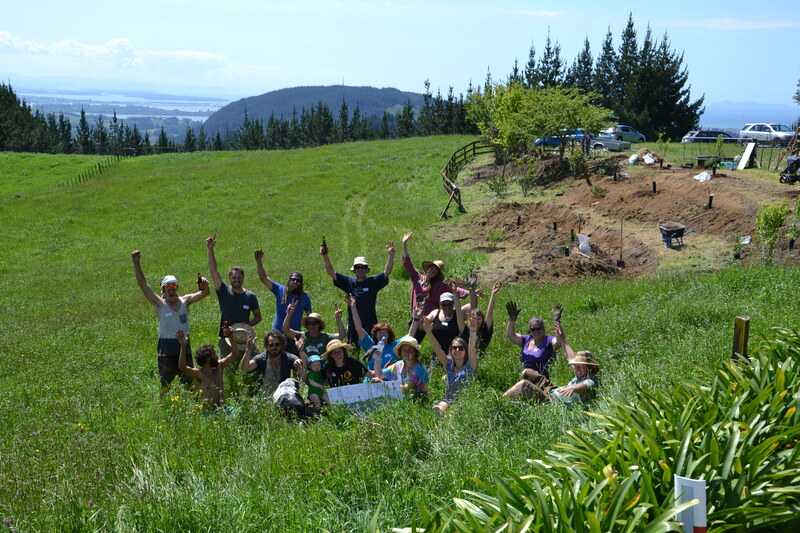 A fellow ‘permablitzer’ would love our help on her beautiful rural Waihi section. We will create a swale on a north facing hillside. We are building this swale to capture rainfall and nutrient runoff. We will learn how to make and use a levelling device to make a horizontal swale. Then we will learn which seeds and plants are appropriate for the task of retaining the swale as we plant them. And if we have time, we will learn how to mark out and dig a second swale. We will also experiment with making seeds balls with New Zealand native species. 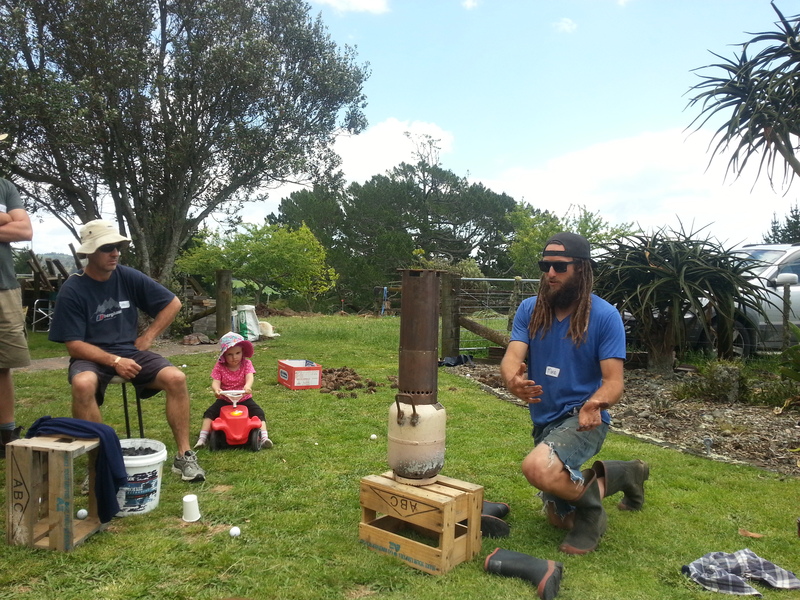 We have a rocket stove to demonstrate. 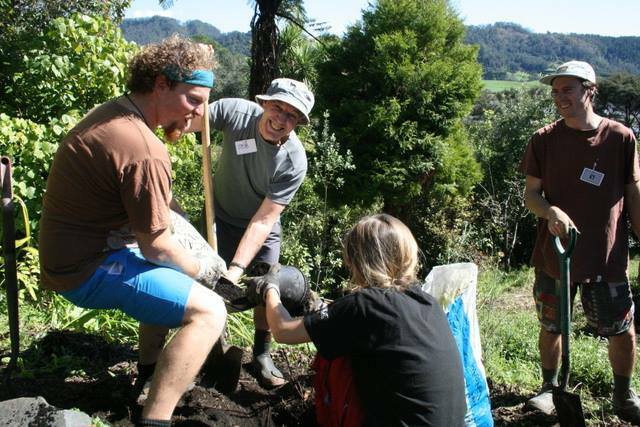 We have plenty of fun tasks for people who are ready to get stuck into digging and getting their hands dirty, and we have heaps of fun jobs for people who don’t! 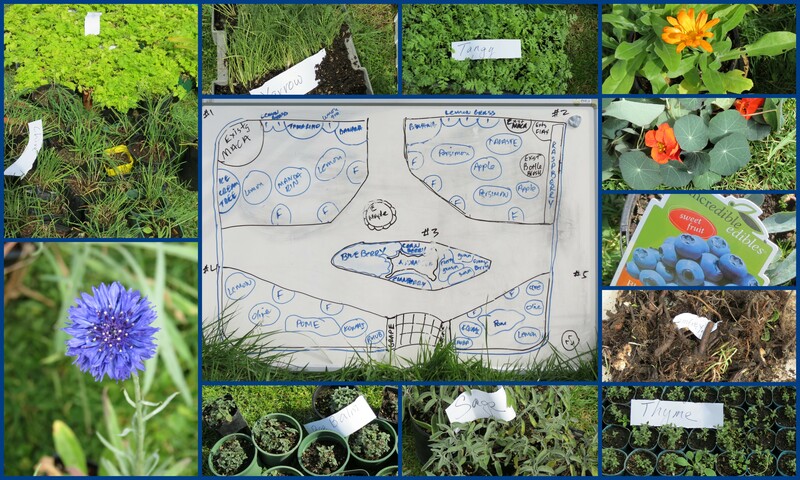 This magical site is certified organic and you will have the opportunity to ask the knowledgeable owner all kinds of questions about the variety of plant species on the property. To register, fill out the form below. The hosts will send you the details. If you have not heard back within 48 hours – please re-register as something may have gone wrong in the registering process. Thank-you! Sunday September 7th was a winner. 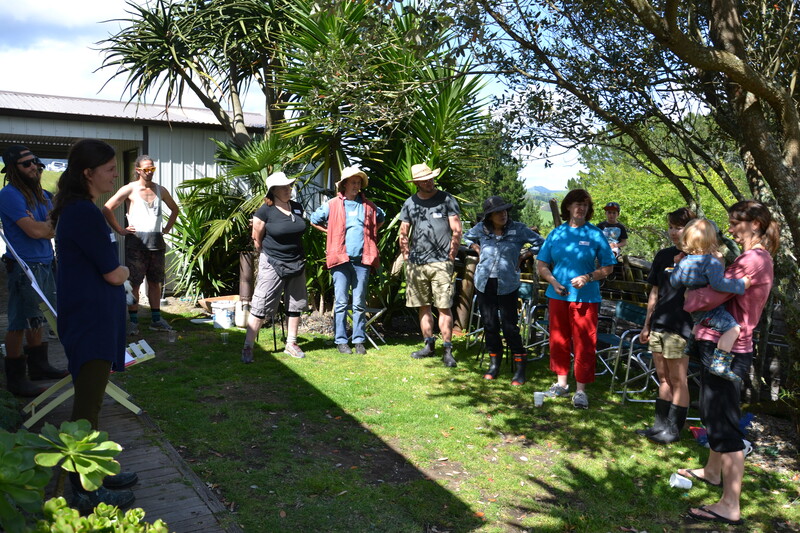 Our hosts Henk and Valerie Hoogland really looked after their hardy band of volunteers at their beautiful property on the shores of Tauranga Harbour at Tanners Point, north of Katikati. 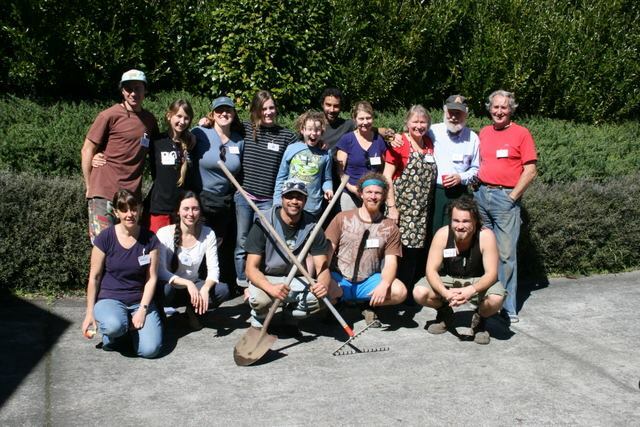 We had a crew of 18 or so energetic permablitzers eager to learn about permaculture and we couldn’t have asked for a better day. Catherine Dunton – McLeod lead the introductions which revealed a very interesting bunch of registrants who had an array of experience that added a lot to the day. 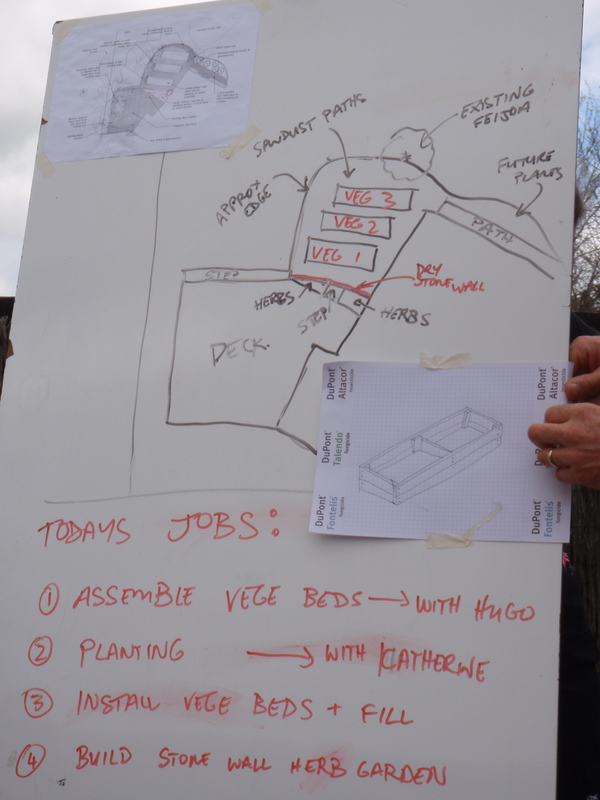 Trish then explained the design she and Catherine had prepared with Henk & Valerie for their garden. It was a well-established garden with many fruit trees already producing when Henk and Valerie moved in four years previously. 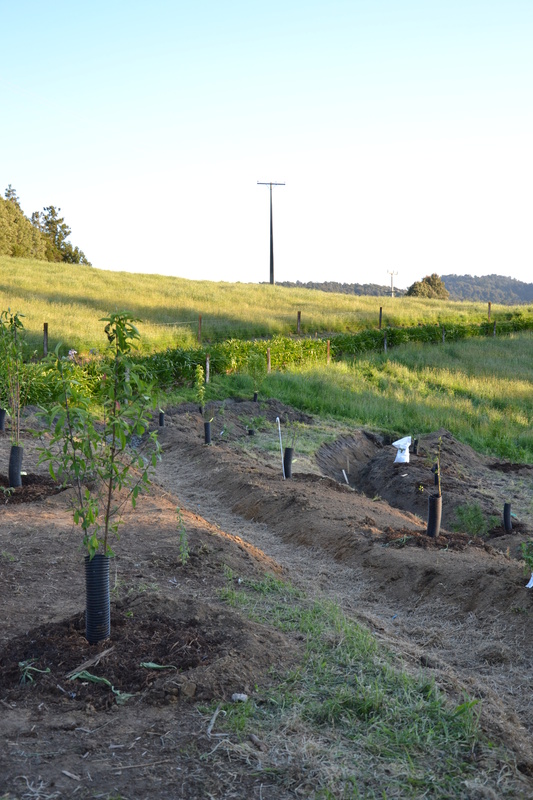 The main aim of the design was to introduce more varieties of fruiting plants, especially Berryfruit and nuts and to form a herbal ley beneath a portion of the orchard, which would be extended gradually over a period of time. 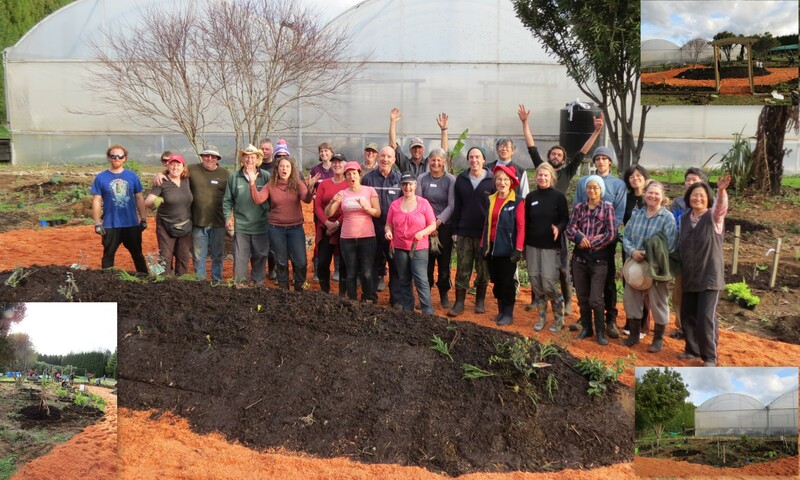 After preparing the orchard area we laid sheet mulching beneath the fruit trees starting with Lime, then followed by wet cardboard, compost, horse manure, coffee grounds etc, dry carbon material then a final layer of chip mulch. Later in the day herbs were planted into this mulch beneath the trees and herbal ley seed will to be sown throughout. 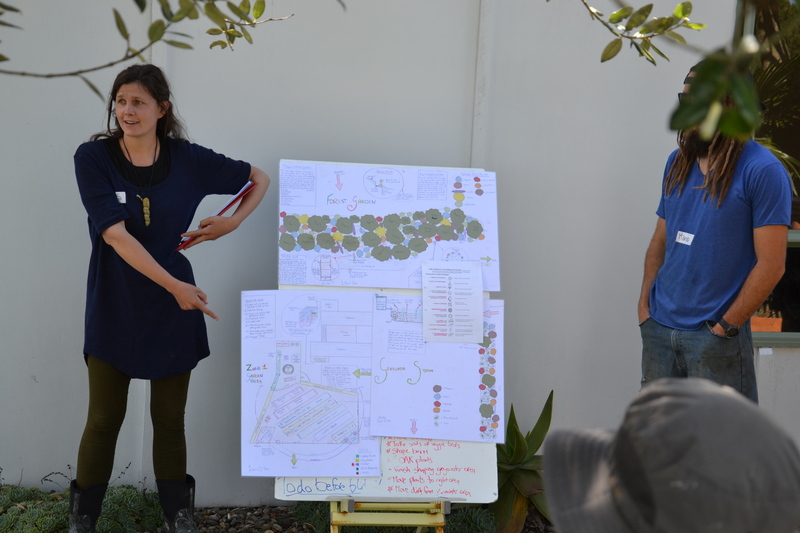 Catherine and Kat held workshops on Berryfruit and Almond planting and Rex gave a very informative talk on Yakon; its uses and how to grow it. Thank-you Rex for the Yakon seed brought to share. 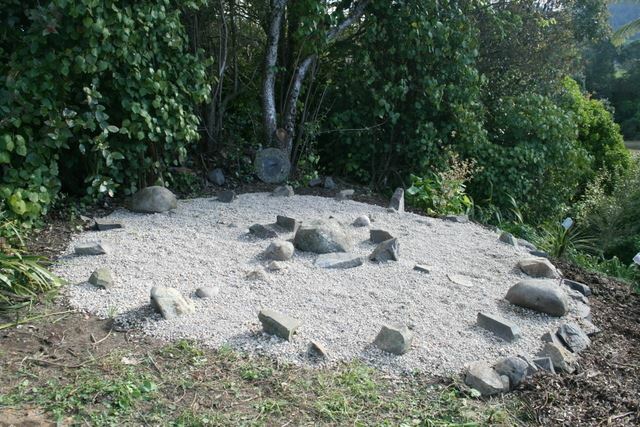 The most popular job was to install a traditional North American Medicine Garden, a wish that Valerie had had for many years, to be fulfilled by us all. It was a special experience for each of us as we placed a rock within the circular space and were given its spiritual meaning. Henk and Valerie provided us with a delicious vegetarian lunch AND Henk and Rex entertained us with some classy tunes on their ukuleles… and other unusual musical instruments. Following lunch it was all hands to the weeding, planting, mulching, and eventually tidying up then we stood back to enjoy the results of our labour. 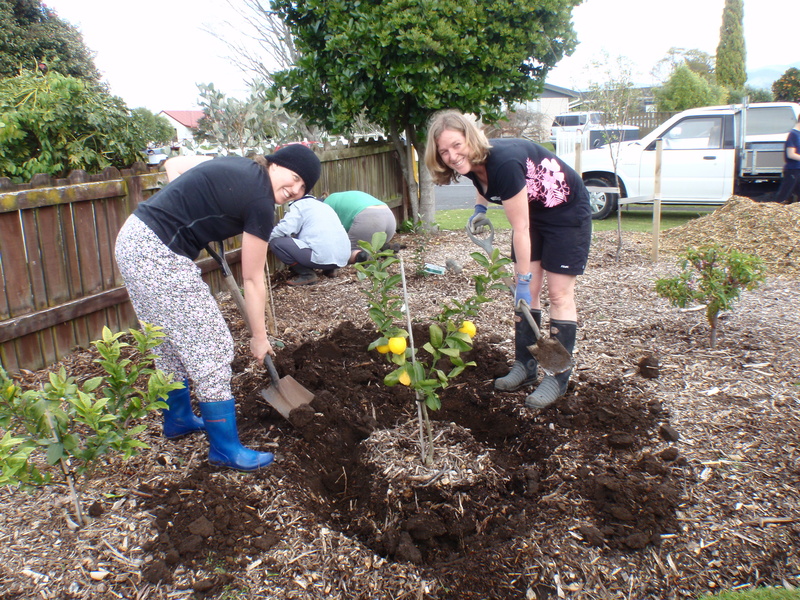 A special thanks goes out to Brett Soutar of Short Back ‘n’ Sides, Arborists of Waihi for the donation of mulch for the garden. A satisfying day for all and a big thank-you to Henk and Valerie for your hospitality. What a day on Sunday August 10 at Sunny and Steve’s in Aongatete!! 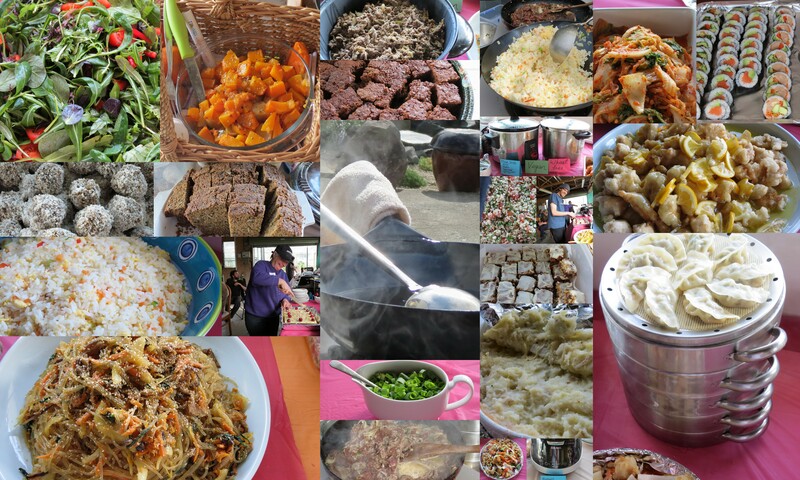 A day full of colour, texture, laughter, learning, giving, sharing……. the list goes on. A magnificent journey in which the land and the people played the main characters. Not to mention the finale; a huge sense of achievement all round and wonderful memories for all involved. Guided by brightly coloured balloons, on a beautiful sunny morning, we were all very warmly welcomed to Steve and Sunny’s blitz. Orange is said to represent joy, optimism, enthusiasm, creativity and success; so a great balloon colour choice as this really was a true reflection of an amazing day. A long time coming, this blitz had a few delays and unexpected events, so it was an absolute privilege to be part of finally being able to give something back to a couple who have given so much of their time and energy to many, many previous blitzes. Pre-blitz preparation onsite to give everyone time to get to know the area and feel at home was the first tell tale sign of an exceptionally well organised and efficiently run day. This was followed by a meet and greet inside and a run down of the day’s events with a brief explanation of the main focus of our work – Guild Building. The ‘Gosa’ (blessing) was the first event on the agenda; a traditional Korean blessing ritual asking for safety and good will for new beginnings. A perfect way to start, especially since it was the first time Sunny had ever lead one herself as growing up and even as an adult, it was always something her Mother did. 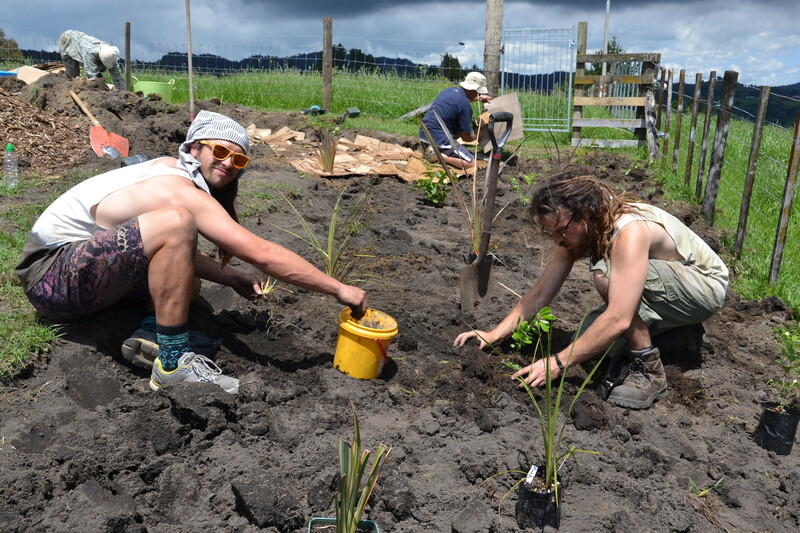 Just perfect, a beautiful way to bring in the wider whanau as well as a soft reminder that the plants are not alone in their growth and establishment in their new home with Sunny and Steve. It was obvious from the plan for the day and the focus on building guilds that Catherine and Marie had put amazing amounts of time into this design, with lots of tidbits of interesting info for people to take away and try for themselves. 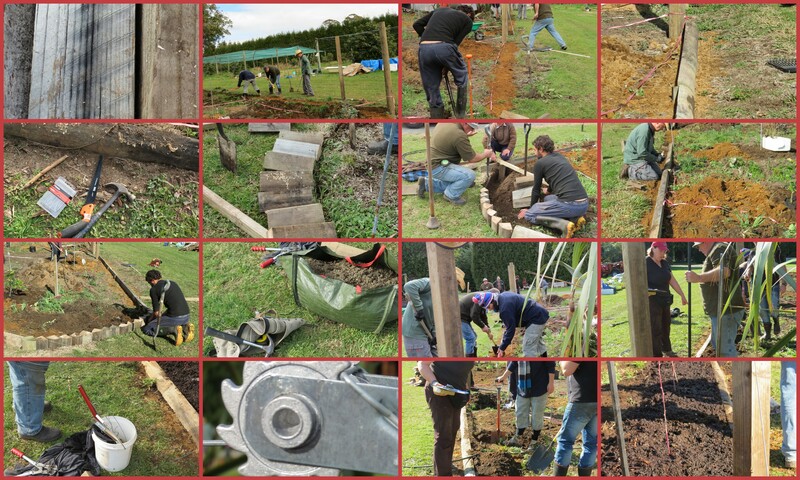 The main plan for the day was to build guilds, a hugelkulture bed for the berries as well as boarder edging and pathways. Nature has definetly got it right when it comes to balanced healthy ecosystems. 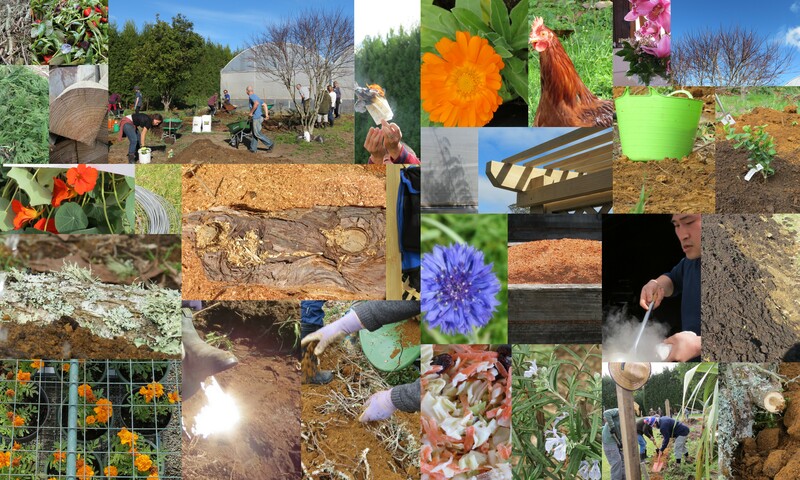 Permaculture Guilds are based on the principles of these natural systems. Every element in nature serves a function and supports each other for the overall strength and sustainability of the system. 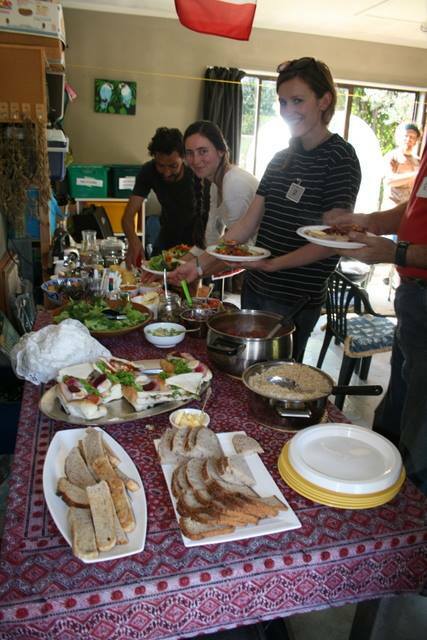 Permaculture attempts to mimick this by including a carefully selected range of plants and animals, each with different functions that contribute to the overall health and stability of the system or family itself. 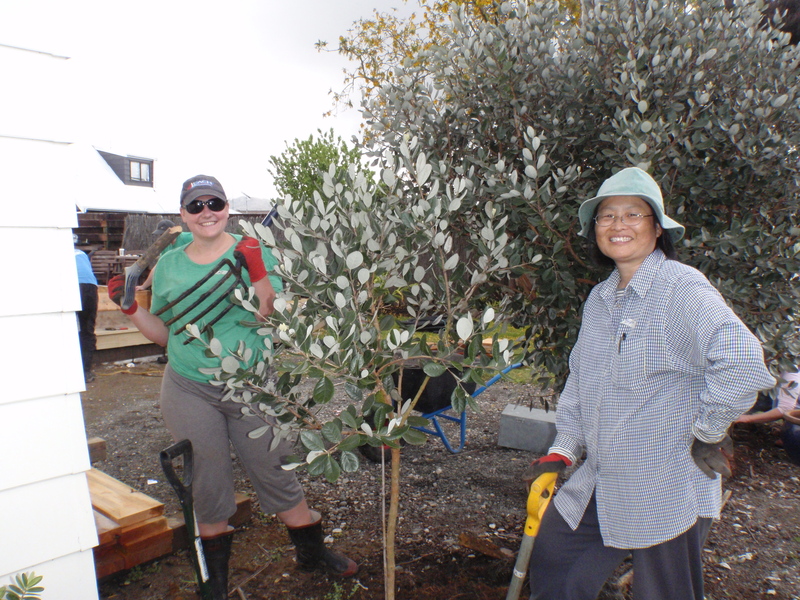 We learned at the intro that Catherine and Marie based their design guild distribution, on Kay Baxter’s 50/50 calculations; http://www.koanga.org.nz/kays-garden-blog-april-2014/. 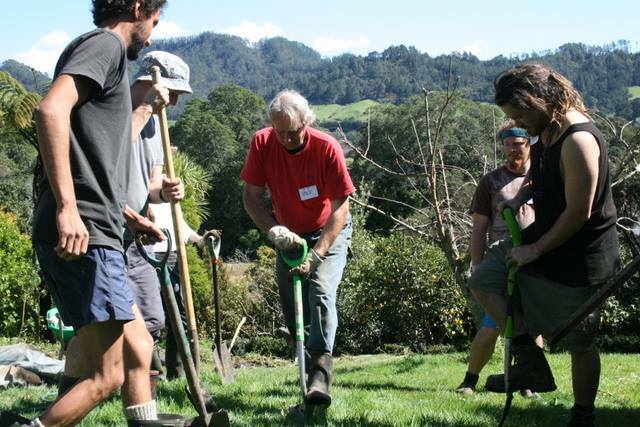 Where 50% of the mature food forest producing area is dedicated to nitrogen fixing plants and the other 50% to everything else that supports the main tree or plant in the guild. We were working with a 300sq metre area, planting was calculated accordingly and all ready to go on the day. Sunny had been growing and collecting plants for months and we had a great supply of lovely, healthy baby plants to serve as companions for the guilds. We were split into groups for the various jobs and off we set, to have some fun under a gorgeous blue sky, in great company. Steve did a great job of collecting sawdust for the paths, compost for the plantings and the right mix of acidic elements for growing berries in. A Hugelkulture bed was planned for the centre of the paths that were weaving their way through the different guilds. The hugelkulture bed was the prefect choice for the berries as it was a way to give them the acidic environment they so love without interferrring with the rest of the plants. The hugelkulture bed is fun idea and a lot of fun to build. Everyone had a ball collecting the material, constructing it, jumping on top of it, watering it, layering it and eventually planting it. A hub of conversation and a real structural centre. It was not only the centre of the garden itself but proved to be the centre of attention as everyone enjoyed watching it come to be. 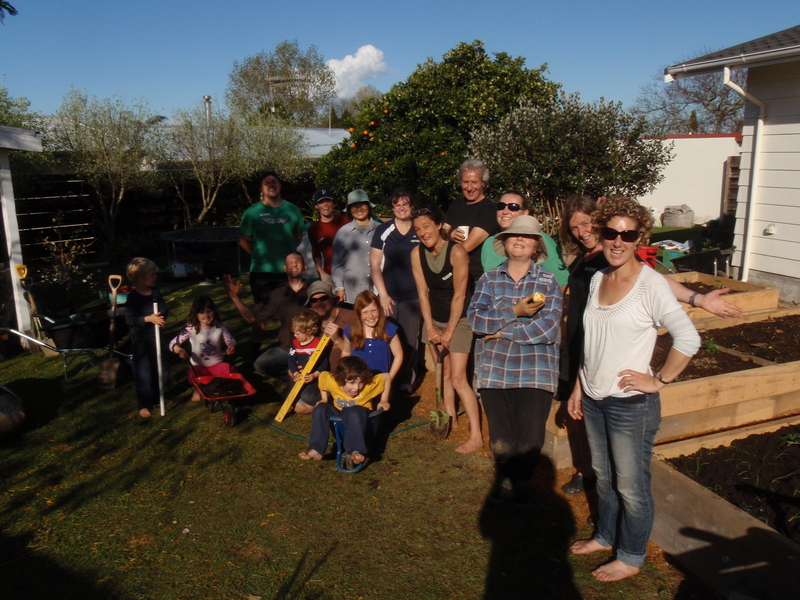 All this lovely community building gave the beginnings of the garden a real sense of belonging with family and friends. As you can see from the Boarder Edging photo collage below, this is where raspberries were planned and what an efficient job it was. Finally I teared myself away from all that great fun and buzz in the garden and walked straight into another lovely warm, colourful, happy zone – the kitchen! Wow, we were in for a treat for lunch!!! 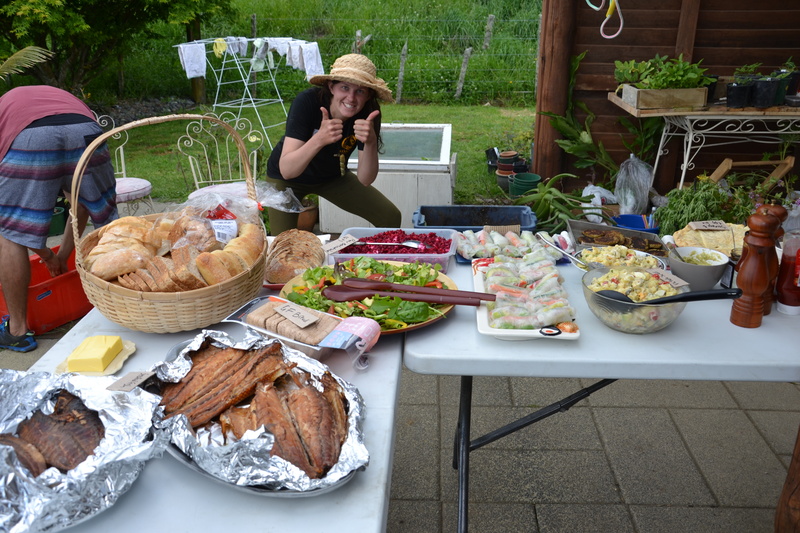 We had all sorts of freshly made goodies coming and all dietary considerations prepared for. Many people have asked for the name of the restaurant owned by the chef who prepared much of the yummy food, so what better place than here to make sure we all know where to go for a great meal. Korean Chinese Restaurant , Rock’n Wok, 45 Fourth Ave., Tauranga. What a lovely family and the sparkle in the eye with a beautiful wide smile on the face of that man while cooking was a sure sign for me of someone who loves to cook. There was also a birthday cake for a couple of blitz attendees who were celebrating their day with us. Wait!, that’s not all, before we headed out Marie gave a little talk on how she has traditionally prepared Saurerkraut in her family for years. It was fascinating with lots of interesting and well answered questions on fermented food. Look at all this glorious FOOD! The group on the day was made up of a great mix of people. 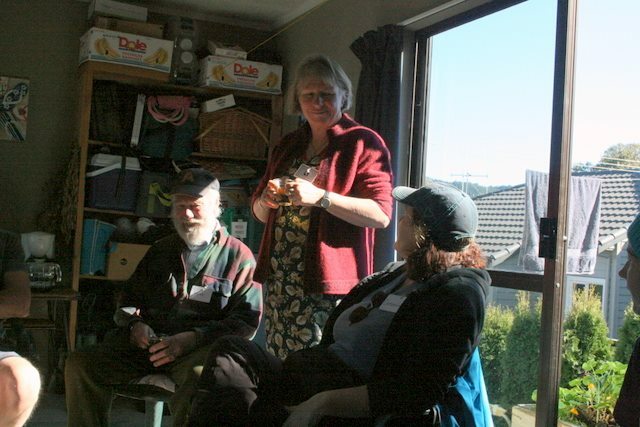 People from previous blitzes, locals, people who had recently moved here from overseas, people from Rotorua, people in their last days in the Bay shortly to head off to exciting new beginnings in the King Country, people planning to have their own blitz very soon, and people planning to set up their own blitz team, not to mention a few participating in or teaching horticulture courses, as well as PDCs. 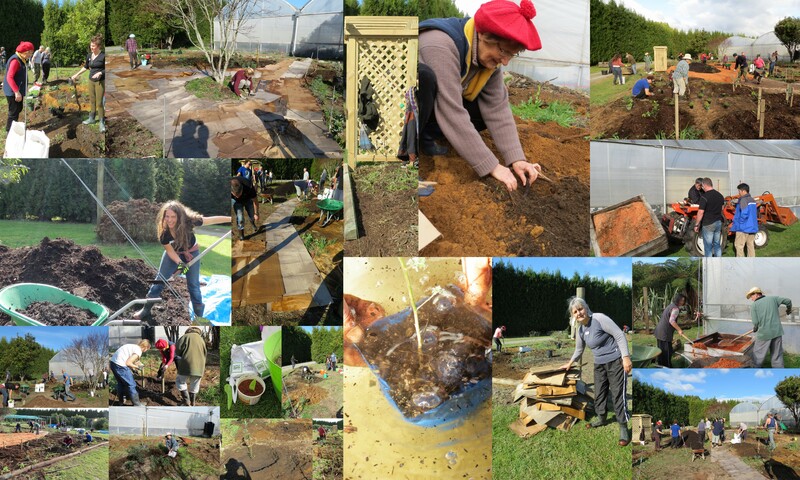 Back to work we go, all anticipating whether or not we would have time to finish the planting, get those pest control and beneficial insect attracting plants in, nitrogen fixing friends as well as a few that help break up the soil.. but so much had happened so far, would we make it? Off we headed, to put down the path, innoculate the soil, supplement the soil with the right mix of support food and compost full of lovely wriggly worms, plant each guild with the appropriate companion plants and top it all off with a yummy layer of mulch to keep all the plants cosy, warm and hydrated. 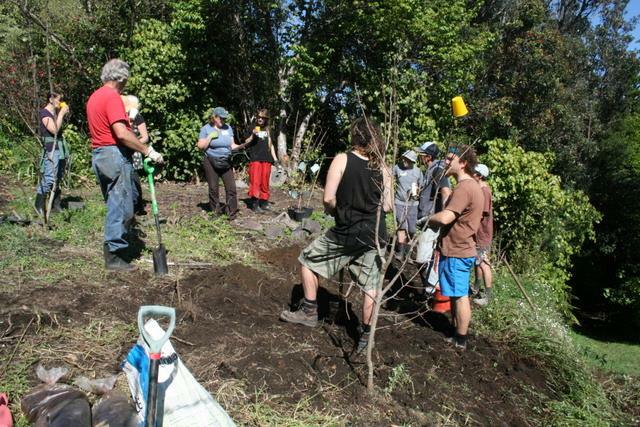 What a Food Forest; Blueberries, Cranberries, a deciduous guild, a mediterranean guild a citrus guild to name a few. Comfrey, Salvia, Thyme, Tangy, Sage, Nasturtium, Chives, Clover, Dill, Mint, Fennel, Bulbs, Wild Flowers…Sunny had done a great job of gathering the family together. We hope this has given you an idea of just how colourful a day we had!! The colour that shone through the most, the brightest, and strongest colour of the day was that of people power. Laughter, team work, fun and a real sense of family. What better way to start of on new beginnings!!! Thank you Sunny and Steve for sharing this with us and thank you to everyone who helped out on the day, what a great bunch of people. None of it would have happened, if it weren’t for Catherine and Marie, thank you immensely for such dedicated, well thought out, planning and design work. What a great team !! Permablitz #13 was held at Kaine and Rachel’s place in Katikati on Saturday 21 September. 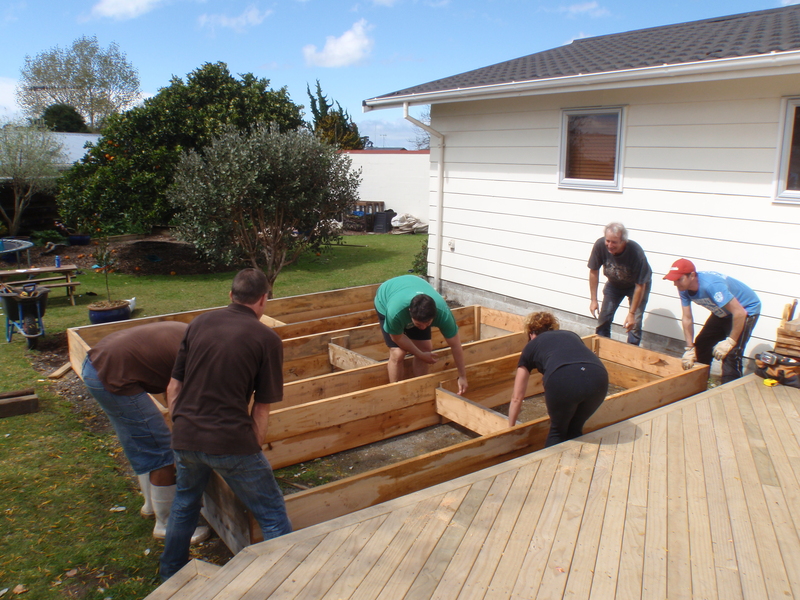 Hugo led the construction of the wicking beds, starting with pre cut 4-meter Macrocarpa boards. 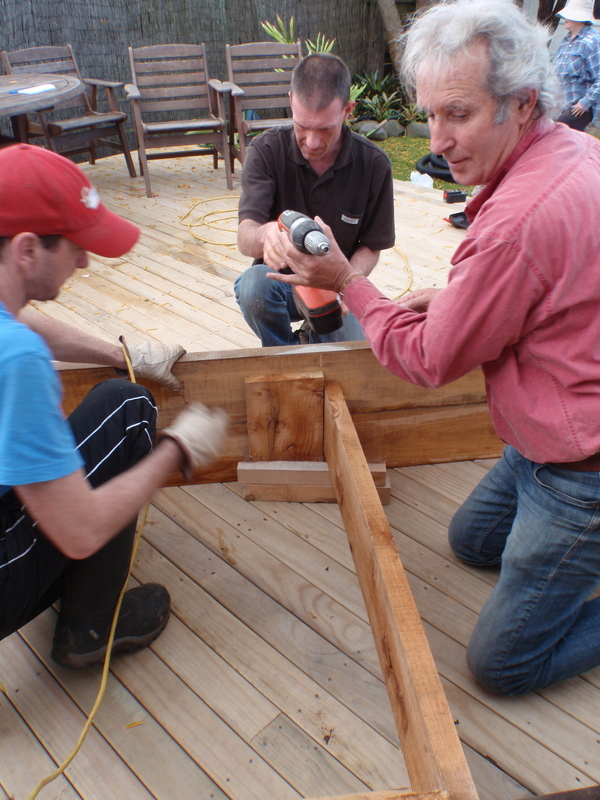 The finished height was 400mm high with corner supports and a centre brace. 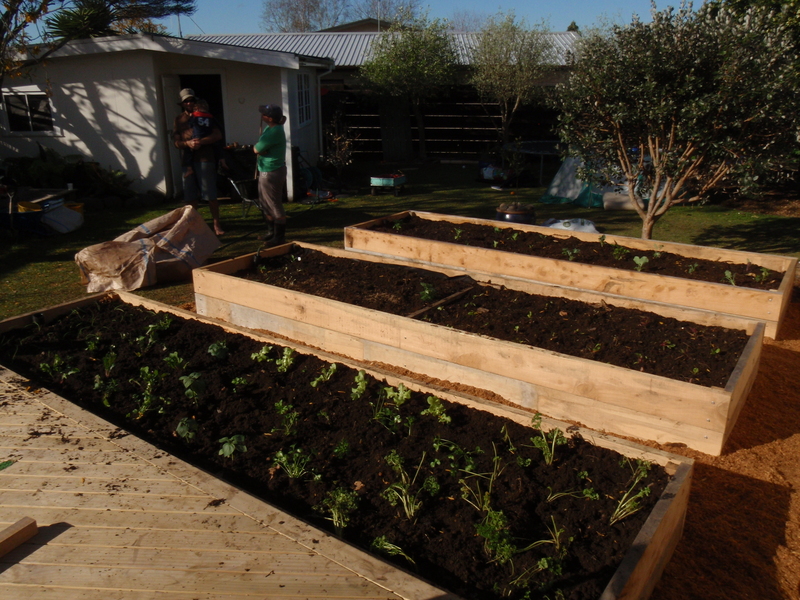 The wicking beds are an improvement on raised beds as they have a wrapped, leaky pipe which runs through the bottom. 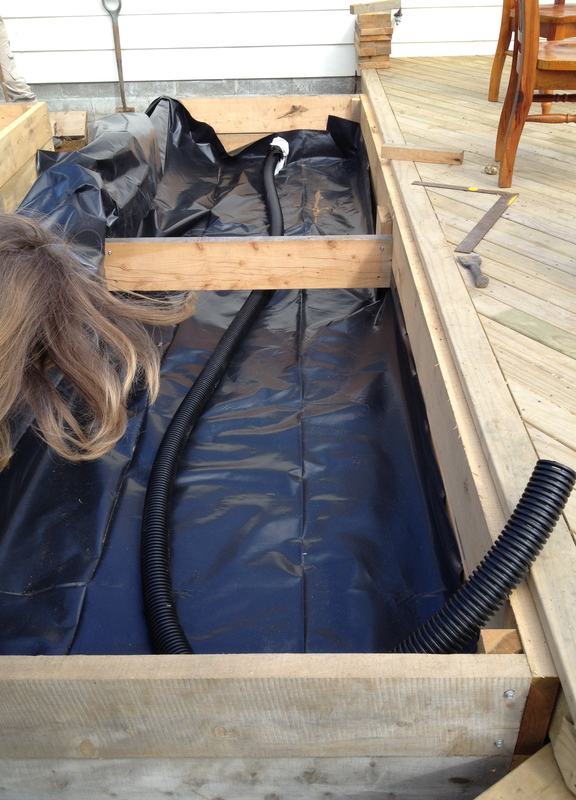 This, along with the plastic liner allows efficient water use, watering plants from the bottom up. Watering is done by sticking a hose in the open end of the pipe and letting the bed get saturated. It’s fantastic for times of drought, for people who are away a lot, or for those who forget to water their veggies. “sock filter” from the building supply store. This keeps the fine bits of dirt from clogging the pipe. 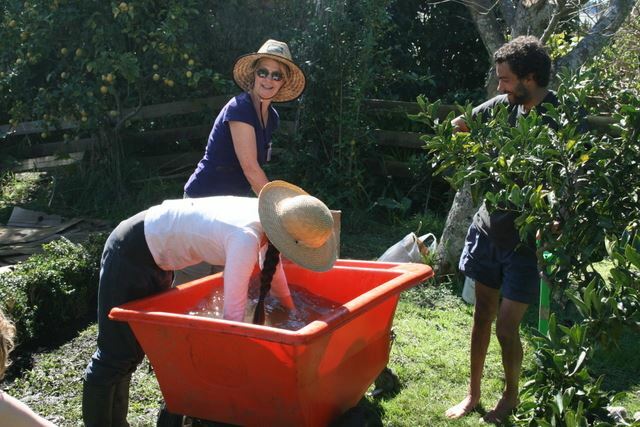 The team then got onto wheel barrel duty and filled the bottom of the beds with 100ml of smooth river rocks (so not to puncture the plastic), then weed mat stapled to the wood. 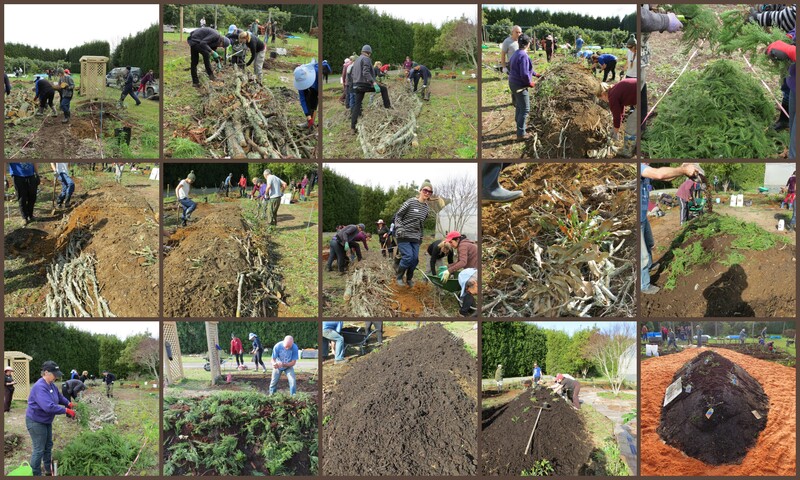 They then repeated layers of basic compost pile ingredients: compost, saw dust, grass clippings, horse manure and food scraps. A mix of topsoil and compost finished the beds, and voila! 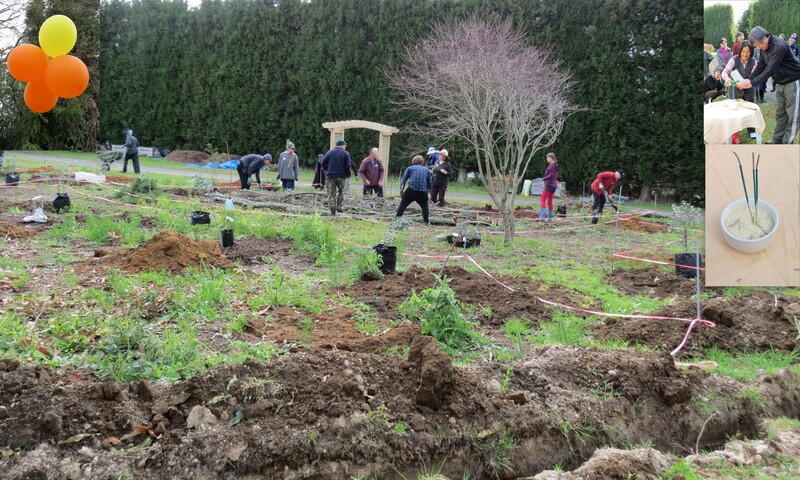 Here are a couple of photos of the planting that happened on the day, besides the wicking beds. A great day of learning and working hard by all! 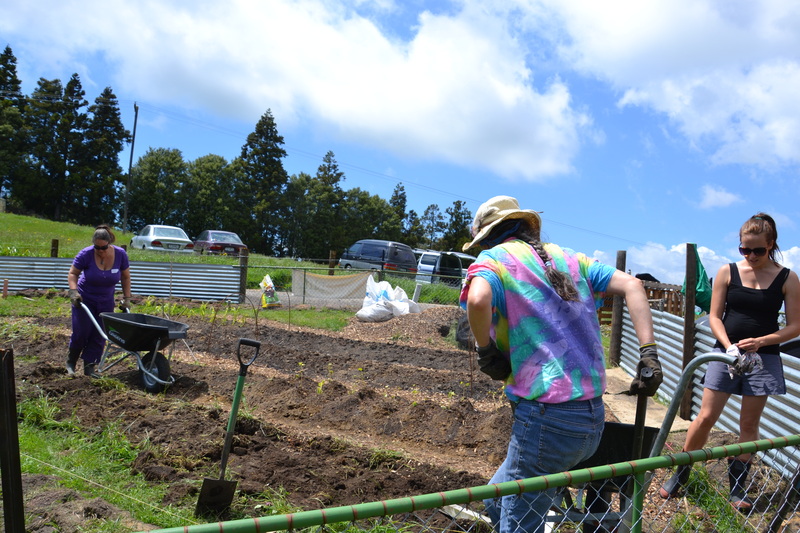 Kaine, Rachel and their two children will be eating fruit & veggies from this garden in no time! And they may even get to sneak in a Christmas holiday and come back to ingredients for a salad, thanks to the wicking beds. 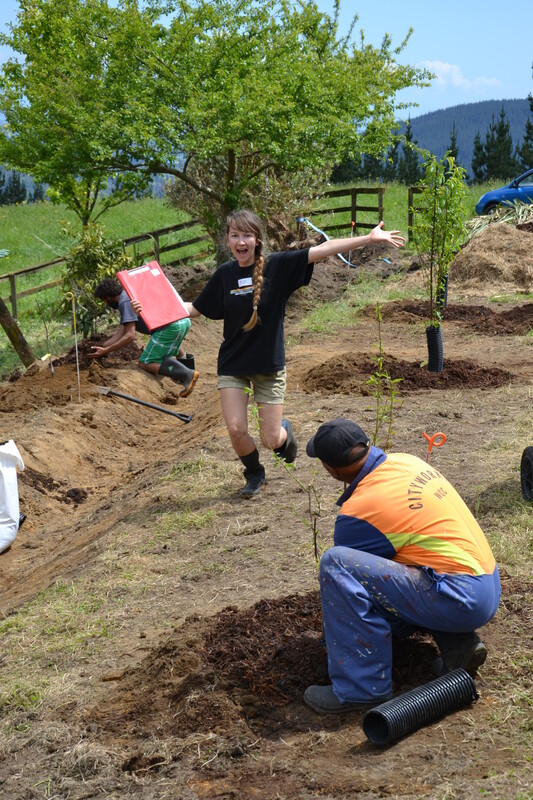 Check out the Permablitz Bay of Plenty’s Facebook page for more photos of this great day!